Twenty-five years ago, Apple released the Macintosh II, a powerful, expandable desktop computer that represented a profound ideological design shift in the Macintosh line. Through its open architecture and color display capability, it echoed the experimental philosophy of Apple’s earliest machines and ignited a new wave of enthusiasm for the Macintosh platform. Equipped with a 16MHz Motorola 68020 CPU, a 68881 FPU (floating-point unit), up to 68MB of RAM, and 40 or 80MB hard drive options, the Mac II was a very powerful machine. It introduced numerous features to the Mac line that users take for granted today. Perhaps the most interesting feature of this expandable system is the story of its origins as a high-tech homage to Apple’s legendary 8-bit computer platform—and how that link to the Apple II helped the company to weather the dark days of the early-mid 1990s. At the time of the Mac II’s release in 1987, there had been four major models of the Macintosh. The three that originated as Macs (and not Lisas, another Apple offering of the early 1980s) were closed, beige boxes that generally discouraged users from fiddling with their internal hardware. They included built-in monitors and could only be functionally upgraded with external peripherals. Many early Mac adopters found themselves saddled with expensive, sometimes underpowered machines carrying very limited upgrade potential. For those reasons, among others, Apple engineers had long wanted to throw the “closed box” philosophy of the original Macintosh out the window and make an open Mac. Steve Wozniak, designer of the Apple II, remembered that sentiment well in a recent email to the author: “The Macintosh engineers and I would have approved [the open] approach from day one.” But his co-founder, Steve Jobs, got in the way. It was Jobs who insisted that the original Macintosh be a silent, closed, appliance-like machine whose inner circuitry would be forever inaccessible to the customer. With Jobs in control of Mac development during the platform’s early years, any hint of Mac upgradeability that engineers introduced was quickly quashed. But Jobs left Apple in 1985, and a starkly different philosophy—the one held by Wozniak—began to take hold in the company. It was time to open up the Mac. In 1986, a 28-year-old Apple engineer named Michael Dhuey led the charge by writing a two-page proposal for a six-slot, modular, color-enabled Macintosh that he presented to Apple executives. Dhuey, a Lisa project veteran and a fan of the Apple II since his college days, sought a way to merge the Macintosh’s software base with the open architecture of Wozniak’s 8-bit machine. The Apple II, released in 1977, enjoyed enormous hardware vendor support due to the fact that any company could create and sell plug-in peripherals for the system. Dhuey recognized that Apple needed to foster a similar open climate with the Macintosh if it had any hope of staying competitive with the rest of the industry. Jean Louis Gassée, then VP of Product Development for Apple, quickly signed off on Dhuey’s proposal as one of three competing Mac upgrade projects. Ultimately, Dhuey’s design won out, and a 16 person team brought the Macintosh II (named in honor of its famous roman-numeraled forbearer) to life. Open became the new rule. 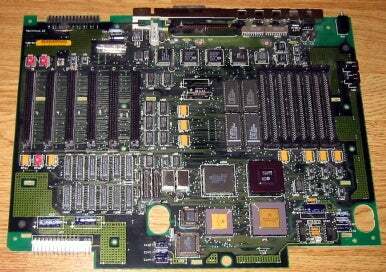 Six NuBus slots are visible on the left side of this Macintosh II motherboard. Both the Mac II and the Mac II’s little brother, the all-in-one Macintosh SE (also released in 1987), allowed users to expand them without voiding their warranties. The fact that both machines allowed users to tinker with their insides showed that Apple’s foray into open architecture Macs wasn’t just a passing fad. The most expandable of the two machines, of course, was the Macintosh II, with its six internal slots. As with the Apple II introduced ten years prior, Apple allowed any user to open up the case of the Macintosh II and insert or remove expansion cards, upgrade components, or simply exhale on its insides with impunity. One of the most unique properties of NuBus architecture was its effortless plug and play nature. Each NuBus expansion card carried with it a ROM chip that automatically told the Mac II how it was to be configured and integrated into the system. When contrasted with the prevailing IBM PC world of confusing jumper settings and IRQ conflicts, NuBus brought a Macintosh-style ease of use to what was, until then, a risky and confusing process. The Mac II’s NuBus scheme also allowed any particular plug-in card to take control of the Macintosh and utilize all its resources. Theoretically, the Mac II could play host to seven different CPUs simultaneously running different tasks, although such a scenario never proved practical. The Mac II had a superior color display for its time. By far, the strongest advantage lent to the Mac II from NuBus was its use of plug-in graphics display cards. Apple offered both monochrome and color monitors for the Mac II, but customers mostly sprung for the color models, which marked a significant upgrade in a computer line that had previously displayed only black or white pixels. That preference threw Apple’s marketing department off guard, so it took some time before Apple could meet demand for color Mac II systems. Color on the Macintosh II was a particularly glorious thing, because not only could the Mac II simply do color, but the system supported up to 32-bits per pixel color depth, which is equivalent to the color standard used in desktop PCs today—25 years later. 24-bit color is enough depth to show any image with colors indistinguishable from a color photograph, and that was a very big deal in 1987. Such capabilities opened the door for consumer-level photo editing apps like Photoshop which, unsurprisingly, originated on the Mac platform. It’s worth nothing, however, that the original Apple brand video card only supported 4-bit (16 colors) or 8-bit (256 colors) color per pixel at 640-by-480 in 1987. Still, that was enough to cause a minor sensation in the desktop publishing industry. IBM’s competing video standard, VGA (which also debuted in 1987), could only show 256 colors at 320-by-200 resolution. The Mac II more than doubled that resolution with the same color depth as a standard option. 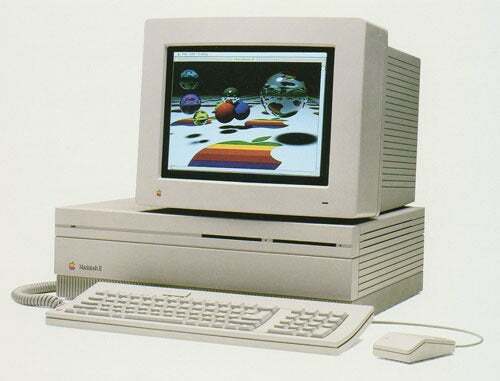 In press appearances, Apple liked to show off the Mac II’s color capabilities with a colorful ray-traced graphic involving translucent spheres and Apple logos. The image had been rendered for the purpose by two Apple employees on a Cray supercomputer. The Mac II also had another nifty graphical trick up its sleeve: It was the first Mac to officially support multiple monitors. In fact, the NuBus system was so flexible that you could install up to six separate video cards in the Mac II—each with its own display—and the Mac System software would automatically extend the desktop across them. Such a capability was unheard of even recently in the PC clone world, but the Mac II could do it in 1987. 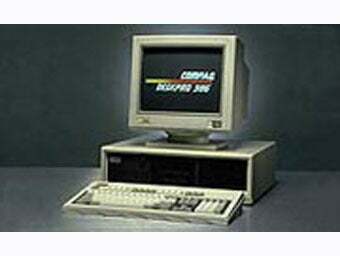 The Mac II beat the Compaq Deskpro 386, Model 40, in InfoWorld's benchmark speed tests. When released, the Macintosh II was not only the fastest Macintosh ever produced, but it was one of the fastest PCs in the market. 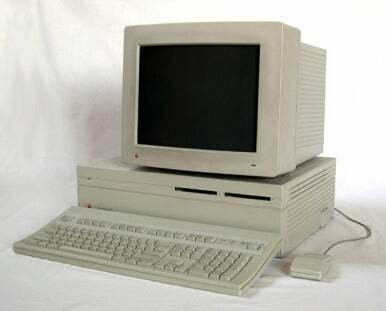 In a 1987 review, InfoWorld compared the Mac II favorably to the Compaq Deskpro 386 Model 40, which until that time had been the fastest PC the publication had tested. The Macintosh II easily exceeded the Deskpro’s performance in InfoWorld’s battery of benchmark tests. In math and science applications, the Mac II’s 68881 floating-point unit (FPU) supplemented the 68020 CPU by drastically accelerating arithmetic operations. And the Mac II’s internal SCSI hard drive was also seen as being particularly speedy compared to PC clone hard disks of the time. All this capability came at a price, of course. A standard configuration for the Macintosh II that included a 16MHz Motorola 68020 CPU, 1MB of RAM, an 800KB floppy disk drive, a 40MB internal SCSI hard disk, an 84-key keyboard, a 4-bit graphics card, and a 12-inch monochrome monitor could run you $6,396 (that’s almost $13,000 in today’s dollars when adjusted for inflation). Replace those monochrome options with a 13-inch color monitor and an 8-bit color display card, and you were looking at a financial outlay around $7,145 retail (about $14,400 today). That’s a lot of money. But those who might reference the mythical “Apple tax” should be warned: In the review mentioned earlier, InfoWorld compared the price of a monochrome Mac II system and a similarly configured monochrome Compaq Deskpro 386 (which retailed for $6,953) and found the Mac II to be $584 cheaper. It is hard for most of us to fathom spending $13,000 on a PC today, but that kind of money bought a world-class desktop machine in 1987. Almost immediately after the Mac II’s release, the press and customers alike lavished praise on the new machine. Despite its cost, the Mac II sold very well and established a line of follow-up expandable computers that extended into the mid-1990s. More importantly, the Macintosh II inspired the high-end Power Mac and Mac Pro line that continues today, although the open architecture philosophy espoused by the Mac II has taken quite a beating at Apple in current years in favor of the closed box (or should I say “sealed box”) iPad approach, which has brought Steve Jobs’ silent appliance PC philosophy full circle. Despite that, the Mac II served as the perfect transition to the future for Apple because, at that time, the industry demanded hardware flexibility. Michael Dhuey, who also worked on the iPod, thinks Apple would have been a much smaller company without the Mac II. “The original Macintosh was not meeting expectations, and professional market needed something better,” he says. It was precisely that professional market—the one served by the Mac II—that kept Apple alive throughout the dark days of the 1990s. With the Mac II, Dhuey and his team built a slot-covered bridge that allowed Apple to survive just long enough for Steve Jobs to take the reigns and steer the company into a brighter future. Happy 25th birthday, Macintosh II.